Classic desk stapler features open-channel loading and jam-proof performance. Recessed anvil rotates for pinning. Offers 7-1/4" long with 4" throat, die-cast base and full rubber pad. Color-coordinated to match Swingline desk accessories. Use standard staples. Durable all steel construction for lifetime performance. 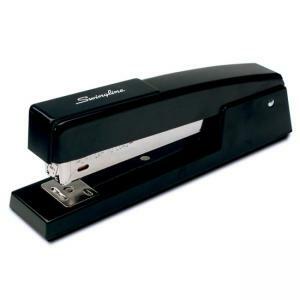 Staples up to 20 sheets.